One of the largest segments of waterfowl is the snow goose. With very liberal bag limits taking lots of birds for consumption is easy. Most hunters make these into sausages and or jerky, however they are also very tasty especially on the BBQ. Fresh goose breasts are used in this Snow Goose Recipe. Caution do not overcook waterfowl, it dries out quickly and very easy. Cut goose breasts into ½ inch sized cubes. Place cubes in a zip-top bag, or vacuum-sealed bag. Add all remaining ingredients except vegetables. Mix thoroughly. Refrigerate mixture for 24 hours. Cut vegetables for kabobs and preheat grill to medium heat. Place meat and vegetables on skewers cook until meat is medium rare. The marinated meat can be frozen in marinade and taken out prior to eating. Using a vacuum sealer can speed the marinating process. 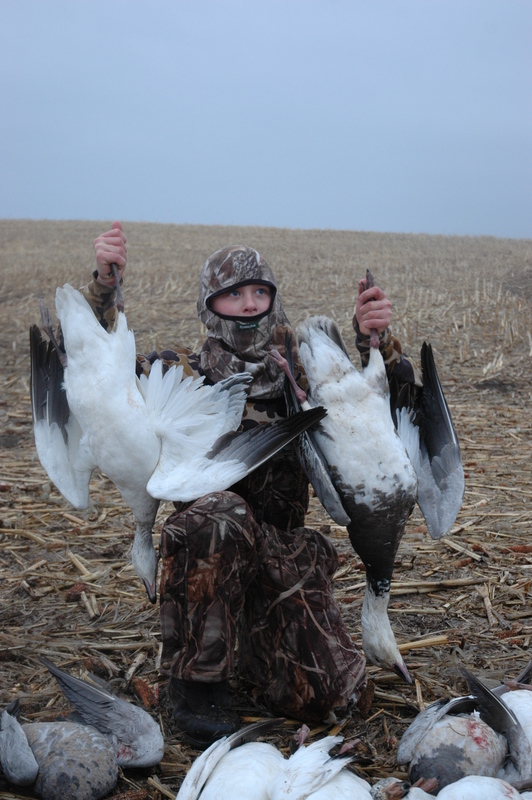 Spring snow goose hunting allows even the young shooters to practice thier skill. Wow I just spoke to a prospective client from near Truman Resirvoir in South Central Missouri and he confirmed that there are numeros snow geese in the area.